Kakunodate"- Little Kyoto" SUBPAGE | All Japan Kyoto Association"
Kakunodate is a town on flat land surrounded by mountains in three directions. Developed as a castle town under the governance of the Satake Kita Family, there are many samurai residences, merchant houses and cultural sites around the town which emit a historical and tranquil atmosphere. In spring, the 2-km line of cherry trees on the bank of Hinokinai River bloom beautifully and impress all comers. The Hinokinai River runs through the center of Kakunodate Town from north to south. From late April, the 2-km line of cherry trees on the river bank becomes a fascinating tunnel of beautiful cherry blossoms. Here, people enjoy cherry blossom viewing under the trees and it is such a festive atmosphere. The bank was completed in 1933 and some 400 of Somei Yoshino variety cherry trees were planted in the spring of 1934, commemorating the birth of the Emperor Heisei. In 1975, the area was designated as a National Scenic Beauty Site. 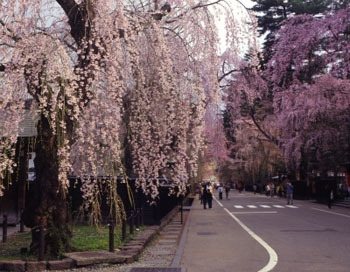 Later in 1990, the area was also selected as one of the 100 Best Cherry Blossom Sites in Japan. The bank along the Hinokinai River is a popular walking course for local people. The clear stream is a good fishing spot where many fans enjoy catching rainbow trout and sweet fish from the early summer. 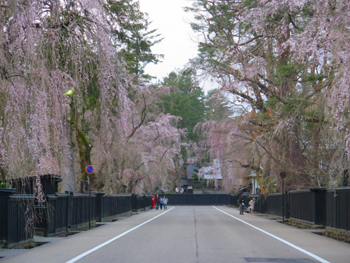 The area around Omotemachi and Higashi Katsurakucho is especially recommended to stroll around for beautiful weeping cherry blossoms. With the traditional Yakui-mon Gate and black wooden walls, the blossoms on about 400 trees appears even more stunning on both sides of the street. Besides the blooming season, the cherry trees and historic townscape of samurai residence always welcome people with their beauty in any season. The weeping cherry trees were planted about 350 years ago after Satake Kita Family came to rule Kakunodate. It is said that the first three cherry trees were brought to Kakunodate when the wife of the second-generation family master moved here for her marriage. The first-generation master, Yoshichika, was adopted into the family but he was originally from the court noble family in Kyoto which might be how Kakunodate became a Little Kyoto in norther Japan. On February 12, 2009, 162 weeping cherry trees in the town were designated as a National Natural Monument. The official name of this temple is Banshozan Tennei-ji, belonging to the Soto sect of Buddhism. It was founded as a sub-temple in 1447 by Morinobu Ashina, the 11th generation master of the Ashina Family with another Banshozan Tennei-ji in the Oshu Aizu region as the main temple. With eight sub-temples, it flourished until 1653 when the young master of the region, Sentsurumaru, accidentally died at the temple. 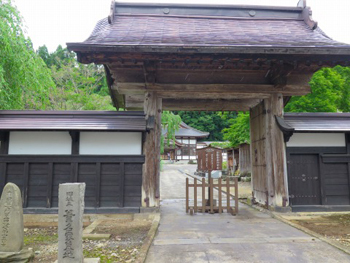 The Ashina Family line ended but the temple was restored by the effort of local people. The San-mon Gate built in 1791 is a remain from Kakunodate Castle and is designated as the city’s cultural property. The main object to worship is the statue of Shaka Munibutsu. Designated on September 4, 1976. The Ashina Family who ruled the area, brought about the large-scale city maintenance in 1620 and the town continued to be developed under the governance of the Satake Kita Family. The preservation district is located almost at the center of the historical samurai residential area where upper and middle class samurai lords lived. 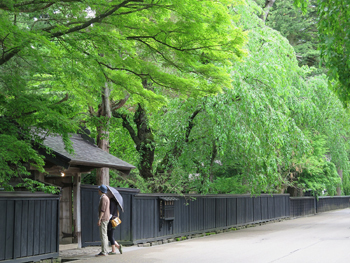 Moats run along wide streets lined with weeping cherry and Japanese fir. Buildings still keep their historical structure from the late Edo period which includes a main residential building, gate, storage and entrance. 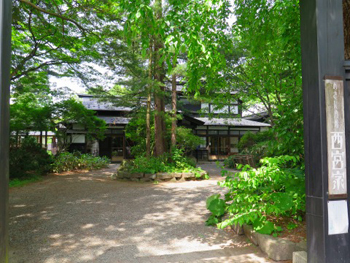 The Kakunodate Birch Craft Center was opened in September 1978 for the promotion of birch craft, one of the traditional crafts of Kakunodate, as well as a tourist center. 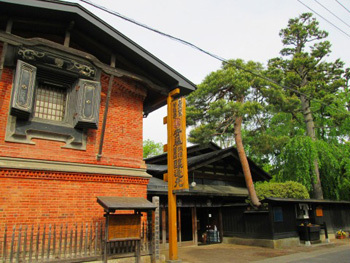 It is the third oldest traditional craft promotion center in Japan whose architectural design follows the traditional style of those of Kakunodate. The interior exhibits birch crafts and introduces the culture and history of the town. Demonstration of birch craft making, a display of the town’s specialties and a café are also found here. There is an open space by the City Hall which is called Hiyoke, or Avoiding Fire. This is the border between the residential area of the samurai and general people. There are many old houses remaining in the Chonin-machi area. 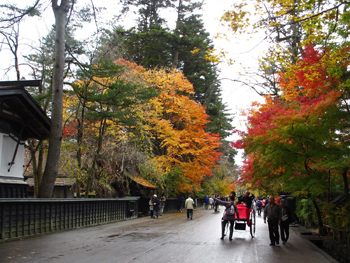 The Tatetsu Family House, Nishinomiya Family House and Ando Family House are open to the public. 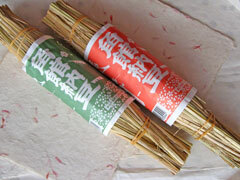 Hiburi Kamakura is an annual seasonal event in February. People hold a long piece of straw, about 1 meter long, and light it. Swinging the straw around the body is believed to get rid of bad fortune and keep the person healthy. In the deep snow, this large number of lights from the swinging straw look magical. Another ritual is that people cover a long 5-meter trunk with straw and let it stand up in the snow, then set it on fire. People burn used New Year’s decorations with this fire and pray for happiness and a healthy life. Kakunodate is a town of cherry blossoms. The Kakunodate Cherry Blossom Festival is held every year and people appreciate beautiful cherry blossoms: Somei Yoshino along the bank of Hinokinai River and weeping cherry trees on the Buke Yashiki Street. Sasara is a local term used in Kakunodate addressing Shishi-mai (the traditional Lion Dance). Sasara-mai Dance is an old tradition of Kakunodate which started in the Edo period. People dance with a wooden music instrument called Sasara which is how this dance was named. 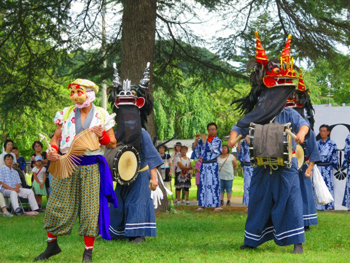 It is said that the first Sasara-mai Dance was performed aiming for getting rid of bad fortunes during the welcoming parade when the Satake Family came into the region about 400 years ago. Today, the Sasara-mai Dance is performed during the Obon period (Buddhist tradition in mid-August) and people pray for a good autumn harvest and a healthy life. 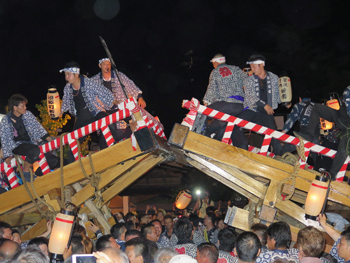 The three days from September 7th to 9th is the time when the town becomes most festive every year. Young people energetically pull massive floats which attracts many visitors. The festival was designated as a UNESCO Intangible Cultural Heritage in 2016. The O-oki-yama float, puppets, Oyama Bayashi music, Te-odori dance and everything in the festival tells of Kakunodate’s long history and tradition which have been handed down by local people up until today. People who plays the Oyama Bayashi music ride on the float and the Te-odori dance will be performed on the stage by dancers from the Kitasenboku region which is known as an area of beautiful ladies. The highlight of the festival is when the floats crash into each other. Young people use their full strength to pull the floats. The birch craft technique was brought to Kakunodate in the Tenmei era (1781-1788). In the beginning, it was a side job for lower class samurai but it became a stable industry thanks to the strong support of the samurai who governed the area. Materials are the cut and polished bark of Yamazakura cherry trees. The finished bark is used to make inro (traditional pill cases), letter boxes, tea containers and other daily items. 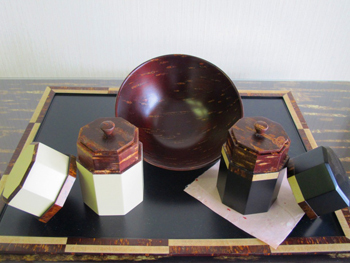 It was the first national-designated traditional craft of Akita Prefecture in 1976. The bark of Yamazakura absorbs air well and the woods natural oils can block air. As a result, it naturally keeps a perfect balance of humidity and dryness. Birch craft is such a luxury craft item. A samurai named Unshichi Matsumoto in the Soma area opened his kiln in 1771. He taught his apprentices techniques and developed Shiraiwa Ceramic. He produced a variety of works from fine ceramics dedicated for the governor to simple daily items. Under his tutelage, Shiraiwa Ceramic flourished successfully, eventually employing six kilns and 5,000 workers. However, the industry declined at the end of Edo period and the kilns were totally devastated by the Rokugo Earthquake in 1896. After 100 years, in 1993, local people and supporters worked hard to restart Shiraiwa Ceramic and it was reborn. The traditional deep blue color attracts many fans. The stems of the young Itaya Kaede maple tree is torn into thin and long strips then knitted. This craft began in the village as a side job around 1790 and the skill was developed. Coats and large baskets were made by the artisans. Today only a handful of people remain who are still skilled in this traditional craft. 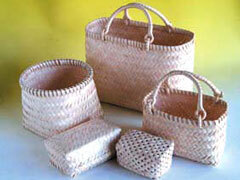 Simple yet warm handmade items are still cherished and the small baskets are still popular today. Visitors can try making a horse with this technique which will be a nice memory and souvenir from Kakunodate. One of the most famous snacks of Akita Prefecture. The powder of red beans is shaped using a wooden former and are baked. Some stories still remain of how this snack got its name but one of them says that the master samurai of the region really liked it and praised it as “No other snacks can be better than this snack,” thus, the name represents this meaning. Made from only red beans and sugar, this simple snack is healthy too. Sanazura is a local dialect of Akita which means wild grapes. The fruity and refreshing taste of this Western style snack comes from the condensed juice of wild grapes. Since olden times, people in this area have made distinctive mochi rice cakes on special occasions and celebrations, but there was no specific name for the rice cake for a long time. When the Kamogawa-za Theatre opened in Kakunodate in 1884, a theatre company called Haruki-za came to the region and settled here. One of the Kabuki actors of the company, Takeroku Minorikawa, is said have been the person who started to produce Naruto-mochi as his side job. He named it Naruto-mochi after Awa, one of the cities in Naruto in Tokushima Prefecture, since its main ingredient is millet, or awa in Japanese, whose pronunciation was the same as the city’s name. Today, the rice cake is not made from millet any more but rice, however, the faint yellow color reminds one of millet’s color. Pickles are called Gakko in Akita Prefecture. Since Akita is a big rice production area, people use rice malt to pickle local vegetables. 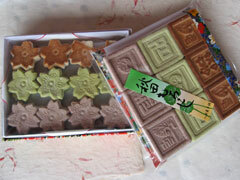 There are many shops in the city to purchase Gakko. Gakko is an essential food on the table in Akita throughout the year and are served as an accompaniment to tea for guests. Long white radishes harvested in autumn are covered with straw one by one and are hung from the ceiling and smoked. Then, smoked radishes are pickled and fermented in rice bran and salt. 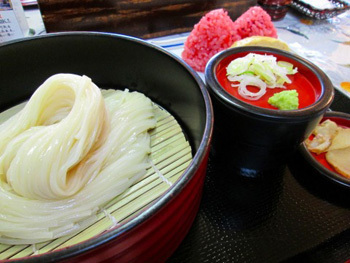 Inaniwa udon is considered one of the three best udon noodles in Japan. Produced handmade in the southern area of Akita Prefecture, Inaniwa udon is acclaimed for its firm yet smooth texture. About 300 years ago, when a samurai governor who ruled this area went out hunting, he enjoyed animal meat on site outside just grilling the meat and putting spicy miso (fermented soybean paste) to add flavor. This is the origin of Okariba-yaki. 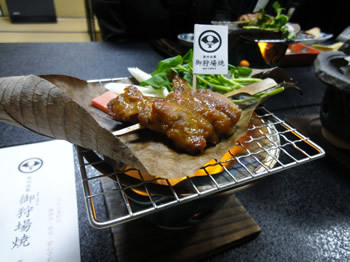 Meat and seasonal vegetables are simply grilled and enjoyed with spicy miso fermented soybean paste. Feel the history of Kakunodate. Miso (salty fermented soy bean paste) is one of the essential condiments for Japanese cooking. Using quality rice malt from the local rice, many farmers in the area produce homemade miso using newly harvested rice and soy beans of the year. Ando Jozo has over 150 years of history in producing miso and soy sauce. They have continued to follow the traditional natural fermentation method while adding improvements during the long history. Farmers in the area produced homemade natto (fermented sticky soy beans). Steamed soy beans were wrapped with straw and fermented in a dark place. There are some places in Kakunodate which still retain the traditional handmade method of making natto. The aroma from the soy beans of this simple food reminds people of the good old days. 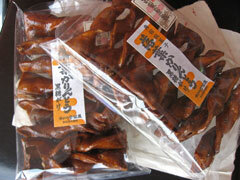 Morokoshi is a popular snack of Akita Prefecture. Generally, morokoshi is baked but the Nama Morokoshi are not dried or baked, hence, it retains the delicious flavor of roasted red beans. 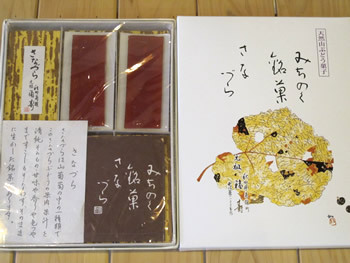 Karinto is a traditional Japanese sweet. Handmade karinto reminds people of pleasant childhood memories. Obako mochi is a simple Japanese sweet which looks like a sweet called Yubeshi. The nice aroma of walnut and sweetness of the dough match well. Dried white radish is hung over the hearth and smoked, then, pickled in rice bran. It was an important preserved food for winter. Kiritanpo is a rice cake which is rolled around a stick and baked, and then, cut and cooked in the hotpot with other food. 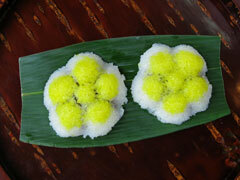 Part of its name, tanpo, originates due to the shape of the rice cake resembling a spear called tanpo-yari. Shottsuru is a soy sauce made from fish which is very unique to Akita Prefecture. A hotpot of fish cooked with Shottsuru is full of the savory taste of seafood. Simple but such a special delicacy.